The Phoeni­cia Library, a cor­ner­stone of the greater Shan­daken com­mu­nity, was badly dam­aged in a fire in 2010. Among the dam­aged items in the library was the Jerry Bartlett Memo­r­ial Angling Col­lec­tion, which con­tained price­less arti­facts and resources related to the Catskill region’s long his­tory of dry fly fish­ing. The Ashokan Water­shed Stream Man­age­ment Pro­gram pro­vided the Phoeni­cia Library with a $10,000 grant to reha­bil­i­tate this col­lec­tion and pro­vide out­reach and edu­ca­tion ser­vices to anglers of all ages and the gen­eral pub­lic about the inti­mate links between a healthy ecosys­tem, clean water, robust fish, and abun­dant macroin­ver­te­brate pop­u­la­tions. The project will pro­vide work­shops, pre­sen­ta­tions and events as well as dig­i­tal exhibits and cre­ation of a web­site. We are pleased to say the library is now open to the pub­lic again. 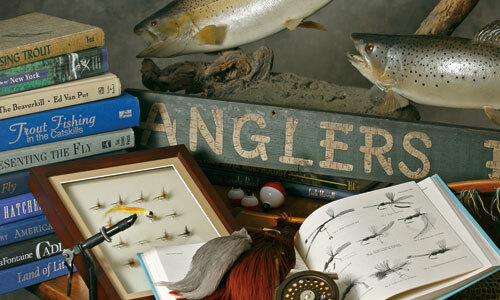 Stop by the library to view the Jerry Bartlett Memo­r­ial Angling Collection!